Like most Canadians you can probably name the ten provinces without pausing, but you might hesitate on the territories. It’s a safe bet that at least once or twice you have stumbled over a phrase in our national anthem. 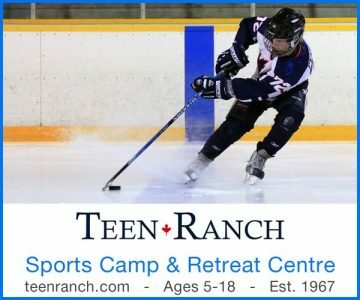 And even if you’re not a hockey fan, there is little doubt you know about that last-minute goal Canada scored on Russia in 1972. These are all uniquely Canadian probabilities. Here’s another one. Even if you don’t know it, at some point in your life you have crossed paths with Corn Flower glass. The new Corn Flower Gallery at the Museum of Dufferin officially opened last fall, with the assistance of grants from Central Counties Tourism and the Canada 150 program. Designed by architects Lebel & Bouliane, the sleek new gallery pays homage to the Toronto showroom (lower) where the Hughes company displayed its glass during the 1950s. Museum of Dufferin P-2370. It may surprise you, but you could have a piece or two in your home. Very likely there was Corn Flower glass in your mother’s cabinet or in your grandmother’s, or on your favourite aunt’s sideboard. 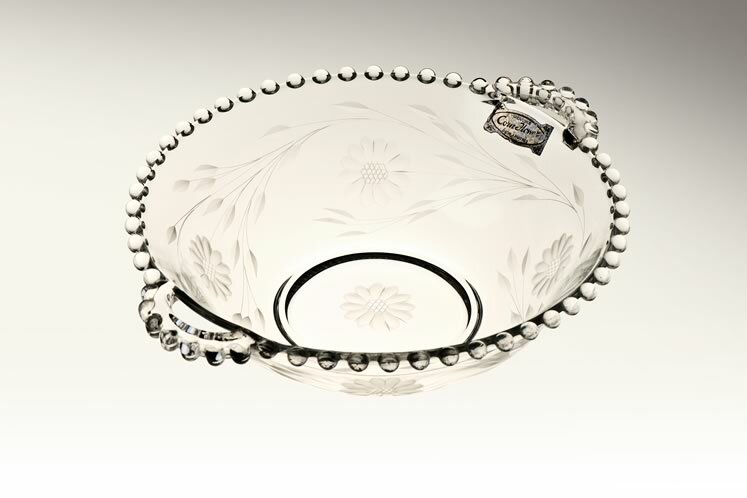 And because there are thousands and thousands of different pieces of this decorative glass on tables and shelves (and in attics) across Canada, you have probably lifted a dainty treat from a Corn Flower glass plate at a social occasion or, after dipping from a Corn Flower punch bowl, unconsciously run your finger along its distinctive floral design. This unique glass may not be a national sport or a national hymn of praise, but it most certainly is a national product. And a Canadian icon. The creative and commercial chapters of Corn Flower’s story began in 1914 when 33-year-old W.J. “Jack” Hughes left his day job as a glass cutter to start a glass-cutting company of his own in the basement of his house on Wychwood Avenue in Toronto. The company became a Canadian success story because from day one, Jack stuck to a set of principles that made his glass a household name. 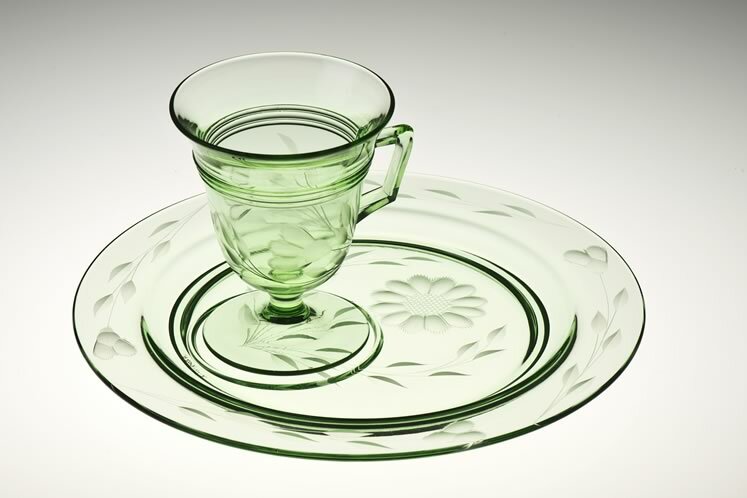 Quality, he insisted, must reign supreme – no customer will ever have reason to doubt a piece of Corn Flower glass. Because the company’s ethic of honesty and superb service prevailed, retail stores became faithful buyers. In turn, customers of those stores became faithful buyers, not the least because most Corn Flower pieces were open stock – if someone needed a replacement or wanted to add to a set, the items were always available. 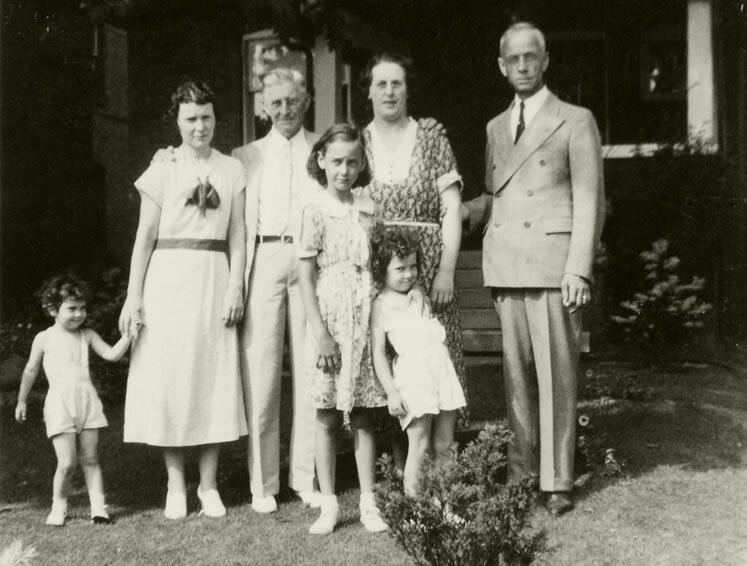 William John “Jack” Hughes (right) with his wife Hazel at his side and their daughter Lois (centre) with relatives at their Toronto home in 1937. Museum of Dufferin P-7044. 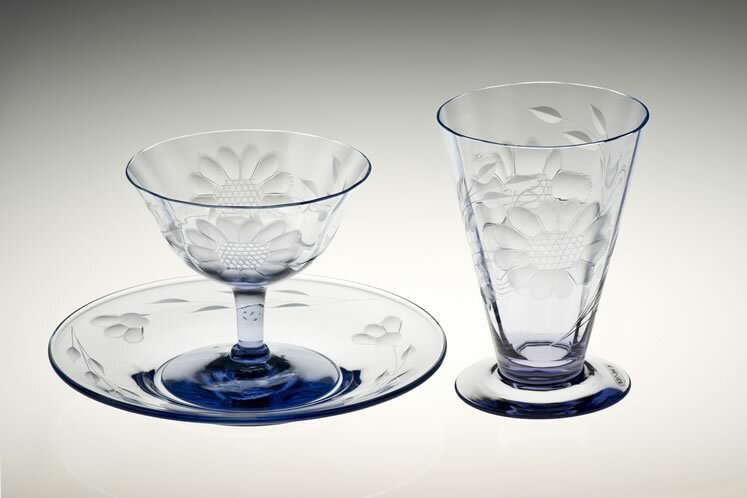 With his Corn Flower glass, Jack Hughes had found a double sweet spot – beauty and price. The pieces coming out of his basement were truly attractive, adding grace wherever they sat. Jack’s repeating floral design of soft petals and flowing vines was a definite hit. An even more important reason Corn Flower was affordable is simply that Jack Hughes wished it so. He wanted to tap into the steadily growing middle class and its quest for luxury at a reasonable price. The glass was classy, it was beautiful, and it didn’t break the bank. Corn Flower became the last word in affordable elegance. 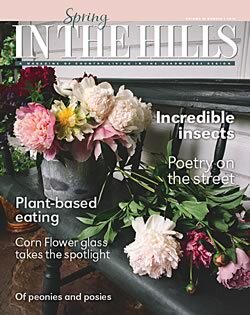 The Corn Flower story might have ended when Jack Hughes died suddenly in April 1951, but fate had stepped in when his daughter Lois married an RCAF pilot instructor named Phillip Kayser in 1944. Always known as “Pete,” the new son-in-law became a key figure in the company. By the time of Jack’s death, Pete was leading an acceleration of Corn Flower glass to even greater popularity. Over time Pete had gently modified some of the founder’s more eccentric operational methods and, once in command, he made even bigger changes. More suppliers were added and more employees. Production was made more efficient. More elaborate – and more expensive – pieces were added to the product line. A man of his time, Pete also believed in advertising and in 1953 the company produced its first catalogue. (Retailers had to pay for it, with the cost refundable on a first order. Jack would have smiled.) For all his changes though, as the company shipped pieces by the thousands around the country, Pete wisely kept the near-sacred Corn Flower design at the core – simplifying it only slightly when machine cutting replaced the original skilled hand cutters. 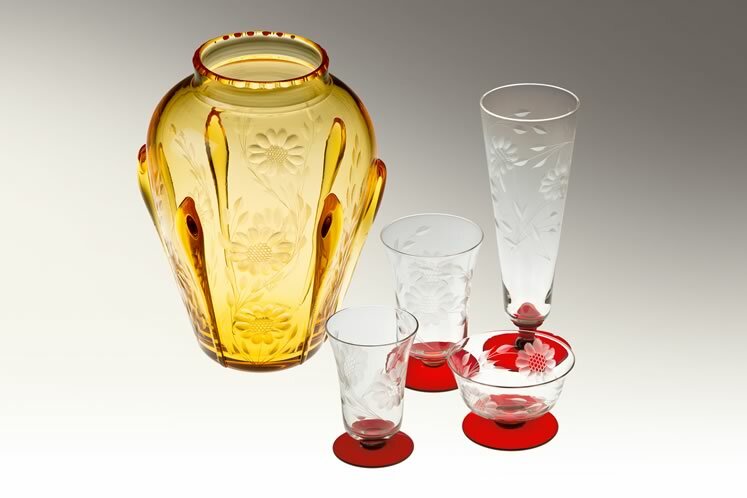 For nearly three decades after the Second World War, the company rode a tide of prosperity highlighted by a boom in home-based entertaining, a grand desire for “nice things” and elaborate weddings – lots and lots of weddings, with Corn Flower glass as the go-to gift. In fact, the company was flourishing in a gift market so insatiable that at first it barely felt the impact of the great cultural shift of the Swinging Sixties. Flower power and minimalism along with the overwhelming proliferation of plastic signalled a new era for consumer products. Even more crucial was the impact of the growing feminist movement. Women, who were Corn Flower’s main customers (and gift recipients), were entering the workforce and looking for fulfillment outside their domestic role. By the late ’70s the glory days of fancy glass were over. Although there were still more than 500 retailers across Canada offering the Hughes company product, customers were no longer lining up at their doors. In 1988, W.J. Hughes and Sons Corn Flower Limited shipped out its last pieces of inventory and shut down. 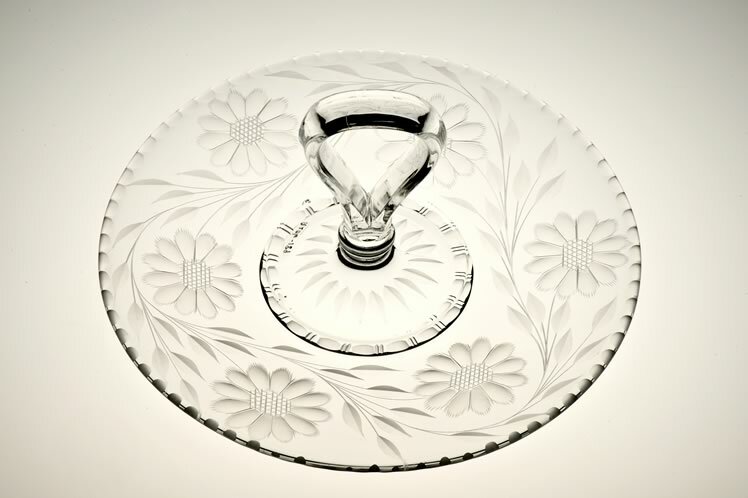 After 75 years of commercial success and popularity, Corn Flower glass was destined to become a footnote in Canadian history. Corn Flower’s new life began with that conversation. 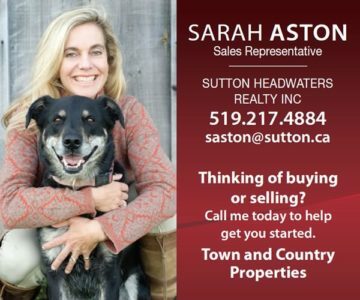 A search quickly determined that Jack Hughes was born in Amaranth Township in 1881; that the family later moved to Melancthon Township; and that like so many country boys at the turn of the 20th century, he left the farm to seek employment in the city. The truth of Jack’s birth was an exciting discovery that presented an opportunity regional museums usually only dream about. How the collection was built in an impressively short time is another remarkable chapter in the Corn Flower story. There are tales of Wayne haunting antique stores and garage sales using his expertise – and very limited budget – to find worthy items, tales of museum visitors donating pieces of Corn Flower they hadn’t realized they owned, tales of others bringing in family treasures to give them a memorial home, and even more tales of supporters pitching in with cash to expand the collection. The ultimate stamp of approval came very early when Pete and Lois Kayser became involved. Their donations of significant, valuable, often one-of-a-kind pieces ensured that the collection became a countrywide mecca, a kind of “Corn Flower Central” for collectors. The Kaysers added expertise, hands-on history and stores of archival data. Perhaps most important, they brought their profile, drawing attention and adding authenticity to the museum’s undertaking. This amber vase was specially cut by Robert Hughes, Jack’s twin brother, for his wife. Such one-of-a-kind pieces are highly valued by collectors. The glasses with the ruby-red bases, cut on blanks from a one-off shipment from Czechoslovakia, are likewise valued for their rarity. Photo by Pete Paterson. Today, 20 years after Ken Gamble watched Wayne Townsend pour from a Corn Flower pitcher, current curator Sarah Robinson can claim with pride that the approximately 2,500 pieces of Corn Flower held by the museum form the largest public collection anywhere and it continues to build. Nor does the momentum end at collecting and preserving. The museum also hosts a Corn Flower Club, produces the Corn Flower Chronicle newsletter and mounts the annual Corn Flower Festival. It all culminated late last year with the opening of the Corn Flower Glass Gallery in the spacious loft above the museum’s main exhibit area. 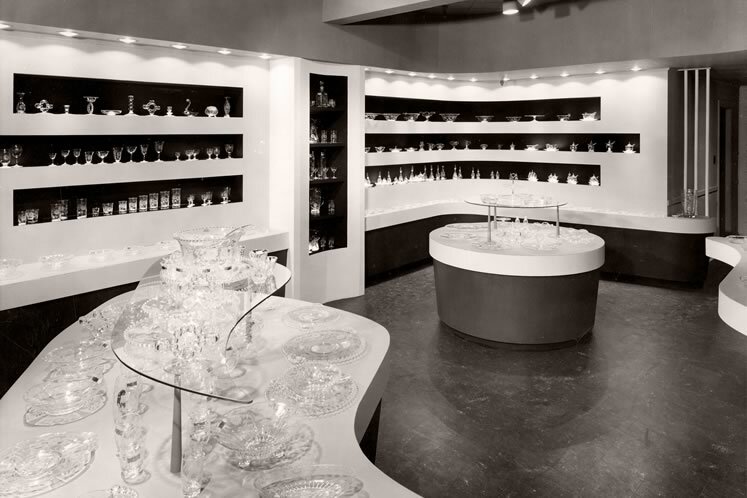 The new gallery is devoted exclusively to Corn Flower glass and its story. 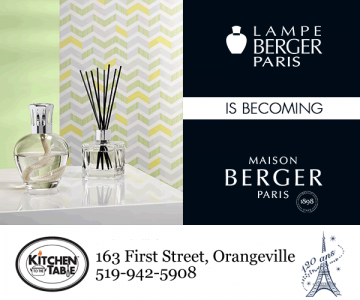 Designed by Toronto architects Lebel & Bouliane, the sleek space pays stylistic homage to the elegant factory showroom where the Hughes company displayed its products in the heyday of the ’50s. 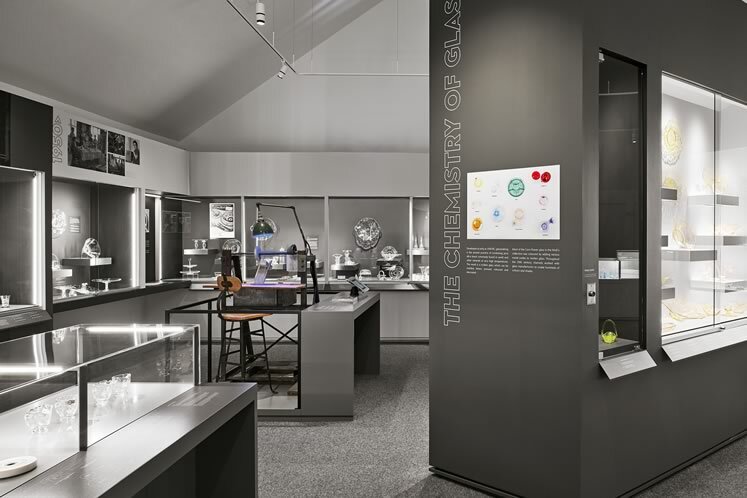 The carefully lit showcases and curated displays allow visitors to appreciate the finest examples of the historic glass – the very glass so many have forgotten in the back of a cupboard – with fresh new eyes. Sadly, Pete Kayser, the former RCAF pilot and heir to Jack Hughes’ vision, died on Remembrance Day last year, just a day after the official opening of the Corn Flower gallery. He was 97. Although he missed the celebration, Pete was confident in the knowledge that his life’s work and the legacy he and Lois (now 92) brought to the Corn Flower story had found a home and will be permanently preserved for future generations. Jack Hughes’ company did not manufacture glass. It was a glass-cutting venture. 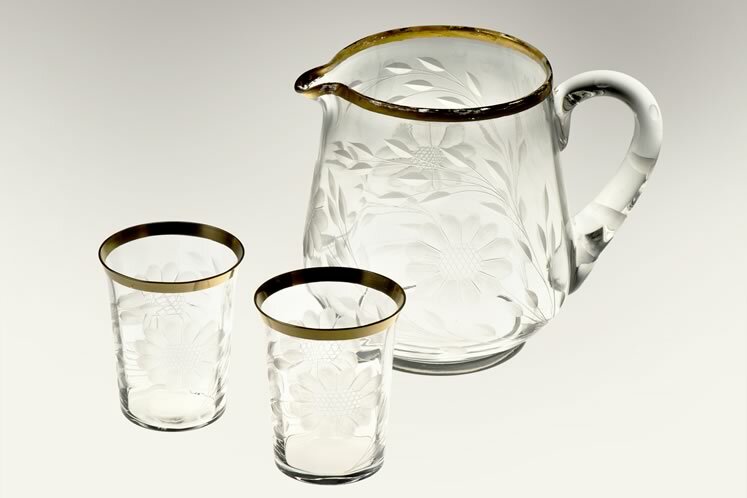 The company bought large shipments of blanks – already manufactured items like pitchers, serving dishes, goblets (the number of different items was huge), and then hand cut the Corn Flower design onto the outside of the pieces, adjusting the pattern to fit the scale of the blank. Only American and European suppliers could provide the blanks of the quality Jack wanted. The bulk purchases not only helped keep the price of Corn Flower relatively low, but allowed for enough production of a particular style to keep it in open stock – one of the reasons the glass had such consumer appeal. Evidence of the sustaining popularity of Corn Flower glass became clear in the spring of 2000 at an exhibition of Ontario inventor-entrepreneurs held at Queen’s Park. 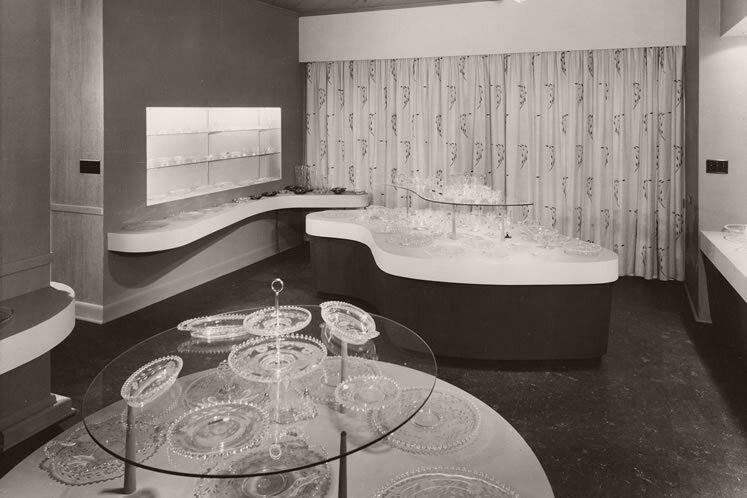 The Museum of Dufferin’s display of Corn Flower glass attracted so many visitors, the exhibit was extended by three months. Another exhibition was held at Queen’s Park in 2014 in honour of the 100th anniversary of Corn Flower. Such exhibitions mark another way the museum collection is raising public awareness of the glass and its uniquely Canadian story. Produced in many colours over the years, a small clear piece of Corn Flower glass can still be purchased for under $20. More rare colours, such as purples and blues, or the colour-shifting “Vaseline” pieces, can go for $500 or more, while a rare one-of-a-kind piece can exceed even that. About a hundred passionate collectors (one of whom sports a Corn Flower tattoo!) come from around the country to the annual Corn Flower Festival held each June at the museum. At the festival, they can have their own pieces authenticated by Corn Flower experts (including Wayne Townsend). It is also an opportunity for collectors to buy and sell, exchange information – and have a party. For those who miss the festival, there is always MoD’s online database. Like the number of collectors, it is constantly growing. 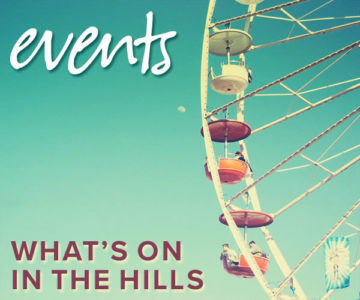 This year’s festival will take place on Sunday, June 9. For details, see dufferinmuseum.com. My Mother, Audrey Violet Martin, collected Cornflower glass, particularly coloured Cornflower, for over 50 years. She loved the “hunt” and proudly displayed her findings in her various cabinets. After she needed full time nursing home care I had the job of deciding what to do with her possessions. Knowing how much she loved her Cornflower glass I was not certain what to do with such a large collection until I happened upon the Dufferin County Museum and discovered their Cornflower displays. I donated my Mother’s collection to them, which they were delighted to receive, and given a receipt for the value which to my surprise came to over $20,000! My Mother, now deceased, would be thrilled to know that her collection is being preserved and appreciated in such a wonderful museum.